"This is very quick and easy dish. My brother was starving one night, so I just started throwing things in a skillet! He gave it the name and it sure is good. This is just the basic recipe, and then with additions of seasonings you can have almost any style (Italian, Mexican, etc) meal you want! Our favorite is Cowboy style, with just a little Worcestershire sauce." Brown hamburger in a large frying pan. Stir in chopped onions, green peppers and garlic. Saute until soft. 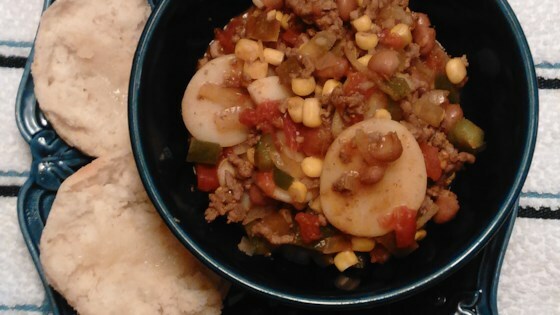 Stir in tomatoes, beans, corn and potatoes. Season with Worcestershire sauce and serve. This is just the basic recipe, and then with additions of seasonings you can have almost any style (Italian, Mexican, etc) meal you want! Our favorite is Cowboy style, with just a little Worcestershire sauce. For my husband the name is very fitting. He didn't like it at all. To me it was more like decent-a-muck. Fast and easy dish. Lots of veggies. Very good recipe. The whole family really enjoyed it. This was quick and easy to make. I used RoTel tomatoes to give a more spicy flavor, and omitted the potatoes. Served with garlic bread and a salad, makes a good, quick meal. Thanks Cindy!